Bringing you the News before it happens! British wind farmers are facing bankruptcy after European Union trade rules have left them unable to compete against cheaper wind from Africa and the Far East. Over the past decade the number of wind farms across the United Kingdom has rocketed as pressure from the environmental lobby persuaded the government that wind power provided a cheap and clean source of renewable energy. But with capital costs so much lower in sub-Saharan Africa, European wind farmers are suddenly complaining that they are being undercut by imports cheaper wind which they claim is of a far lower quality. But isn’t it sad the current generation laments how wasteful the old folks were just because they didn’t have the green thing back then! In the year 2017 the United Kingdom, as it was, is much changed. Scotland has it’s independence and a bank rating slightly below Greece and Little Britain is a very different place. In the name change of 2014, due to the Referendum on EU membership run from Brussels, as well as a downgrading of the state, Emperor Huhne was appointed and now resides at Buckingham Palace. The Queen and Prince Philip have moved to an old folks care home in Essex courtesy of the new Emperor. Prince Charles is believed to be living on the Balmoral Estate but only intrepid explorers now venture North of Milton Keynes. After the 2ndexpenses scandal (?) of 2013(the dodgy dossier) the Houses of Parliament have been turned into a high security prison ensuring that those Climate Change denier, anti wind-farm MPs of the revolution of 2012 are incarcerated for life. The new Government is now run by Brussels through the Department of Energy and Climate Change. The country has become an urban paradise and the only residents of the countryside are reduced to gibbering imbeciles running around with their hand over their ears kicking turbines. This is of no surprise to the chattering classes in London who believed that was always so. And how the countryside has changed. From a point north of the Thames corridor, white and silver leviathans cover every metre of ground in a silent homage to the gods Paucholi and Gore. Even the empty plinth in Trafalgar Square is shared by these two giants of Climate Change. Well the turbines do remain silent for 82% of the time as a lack of wind, predicted in 2011, has proved the only thing that they got right. French Nuclear energy provides the lights for London and the South East. Major brownouts are a feature of the rest of the country. Of course, the wind farms are not underperforming. 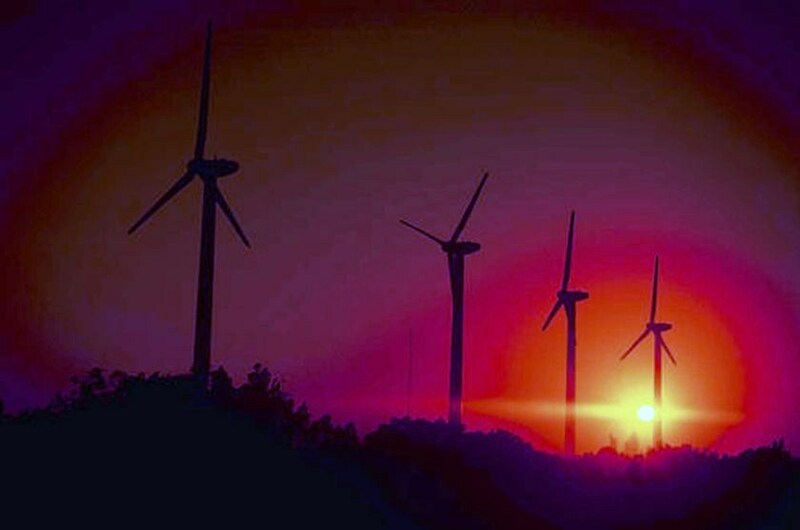 It is the anti wind terrorists that are blamed for the phalanxes of blackened, rusting, oil spewing distorted monsters that litter the fields of turbines. Lack of funding, revenues diverted to French power companies for Nuclear energy, reduced subsidies and with that the foreign wind farm owners disappeared to fleece more profitable sheep. Maintenance suffered and turbines exploded in self emolument, blades flew from uncontrolled rotation and oil spewed forth and tainted the land. 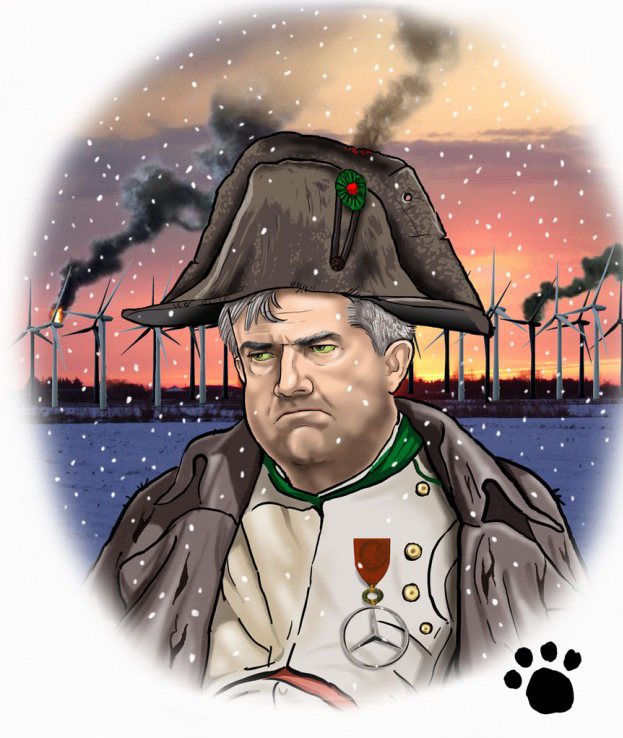 Emporer Huhne’s beautiful wind mills danced the dance of destruction. Only in the further reaches of the isles do a few Glens and Mountains stand clear of this visual pollution, protected by an Amazon race of Highland women, the limbs and heads of deceased French and German wind farm installers still poke through the winter snows in stark mortis. Only there does the kite and buzzard fly replete on their unexpected banquet. And what of the young? In a primary school in those reaches south of the Thames, a small child comes to the teacher to tell her that Mr. Turbine is angry. She gathers her class at the feet of the school playground turbine and with great glee and excitement assures the children that Mr. Turbine is so happy that today the wind is blowing that he is spinning so fast that sparks are flying. She encourages the children to sing the Green Song. A harsh crack and thump and pieces of blade fly across the playground. “Oh, Rowena, you’ve lost your head and look at Jemima’s blouse. Her mummy’s going to have to wash that. Bobby, stop kicking Rowena’s head all around the Playground” Inured to the daily screening of the Climate Film 10/10, it is of course assumed that those children now strewn grotesquely across the playground are all climate deniers, indoctrinated by evil parents. As the class return to their classroom, the teacher briefly wonders whether the sudden reduction in the school roll may affect her job. wanted to say thankyou to Dougal Quixote for the bit of a relief, I hope he wont mind that we added that lovely bit of pathos to our blog, it nods to him, replete with website address too! Lovely I could just see it! I really think that Emperor Huhne should pay attention to the threats from China, and even Norway, both of them working on Molten Salt reactor science. Norway launched, no kidding, a study of Thorium energy capabilities with the requirementt that their report be “knowledge based”. This observer was puzzled at first by the phrase, until he realised how much public energy discourse is Ignorance Based, both the denial that human industrial effluents are responsible for global ice melting, and the pathetic idea that wind and sun and even rain will be enough now, when it wasn’t enough at the time of the American Revolution.